The Gualala River drains a watershed of 298 square miles of steep coastal mountains with numerous creeks. Most creeks are in rocky canyons. There are three major sub-basins: South Fork, North Fork, and Wheatfield Fork. Near the ocean, the river widens out into an estuary. The western and central portion of the Gualala River watershed is covered with dense coniferous forest. Oak woodland and grassland covers the eastern portion of the watershed. Logging started in the 1860s. Redwood and Douglas fir logs were hauled or floated down waterways to the mill at the river mouth; then the milled lumber was hauled to small coves along the coast. In these coves, there was just enough room for a small ship, also known as a dog-hole schooner, to anchor and load its cargo. Most timber was shipped to San Francisco. In the early 1900s a 22-mile logging rail line was built along the south fork of the Gualala River. Ridge tops in the Annapolis area were planted with apple orchards. Sheep and cattle ranches covered grass and woodland areas. In the 1940s-1950s, a population boom in California brought widespread clearcutting of the Gualala forests. Numerous dirt roads were cut and creeks were graded for use as roads in the dry season. Tractors dragged cut trees down steep slopes and along creeks where the trees were loaded on trucks bound for the mill. In less than 20 years, most of the remaining first- as well as second-growth timber was cut. The effects of this second era of clearcutting included numerous landslides, very high siltation rates, and damaged creeks. During large floods, the confined creeks and river channels filled with more sediment than could be scoured out by the flood waters. Summer stream flow became subsurface and remains this way in many locations. Logging removed most of the trees shading streams. A comparison of 1942 and 1968 aerial photos showed 40-70% of the total stream length exposed by the clearcutting. By 1999 the forest had re-grown to expose 25% of the total stream length. During the 1990s, vineyards were developed along the grassy ridge tops, replacing the apple orchards. Tan oak bark was harvested and hauled to ships for leather tanneries in San Francisco. 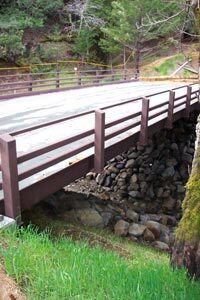 Building a railroad bridge over the south fork Gualala River. Hauling apples over Skaggs Spring Road in 1922. Clear cut logging in the 1940 and 50s used practices that left a legacy of erosion and siltation of creeks and fish habitats. Despite all of its past logging the Gualala River watershed supports anadromous fish. Brothers Nick and Andy Peay developed vineyards on less than 50 acres of this 280-acre site in 1996. This site was formerly occupied by apple orchards, grazing lands, and a homestead. Peay Vineyards encompasses the headwaters of five creeks and uses sediment basins and cover crops to conserve soil and protect water quality. This 391-acre site stretches from the ridge top to the South Fork of the Gualala River and includes a large coniferous forest. The 30 acres of vineyards are located on the ridge top grassland. This area of the watershed was extensively logged in the 1950s and retains numerous eroding hillside roads from this era. 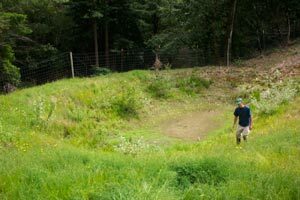 As part of the vineyard development the old logging roads were repaired and storm proofed removing a source of sediment. See also Knights Valley site. Cliff Putnam and his family have lived in the Annapolis area since the 1970s. Their 39-acres of vineyard use very little water. Prior logging operations in this area used creek beds as roads and only recently have the creeks begun to recover. 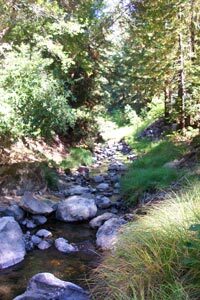 The Putnams have completed extensive creek and forest improvements. 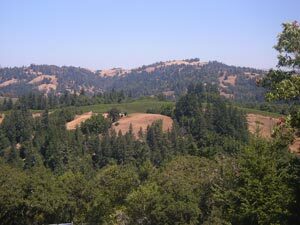 This small vineyard is located above Tombs Creek in the eastern area of the Gualala River watershed. Tombs Creek on this site has year-round coldwater flows and good steelhead trout habitat.